Professor of Law, University of Liege (ULiege) and Liege Competition and Innovation Institute (LCII); Visiting Scholar at Stanford University, Hoover Institution; Research Professor, University of South Australia (UniSA). Nicolas.petit@uliege.be or petitn@stanford.edu. I would like to thank Doug Melamed, Michal Gal, Alex Galetovic, Axel Gautier and Thibault Schrepel for their comments on a previous version of this paper. I am also grateful to Jerome de Cooman for excellent research assistance. This paper complies with ASCOLA Transparency and Disclosure Declaration. I have nothing to disclose. 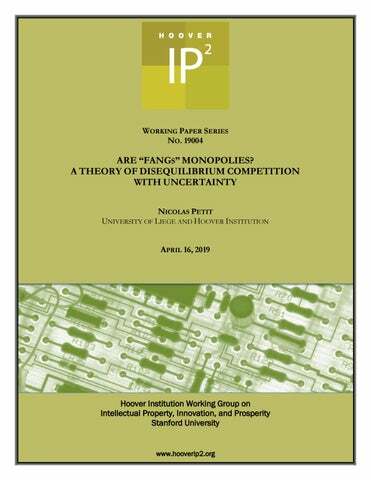 competition and regulatory findings against them.1 And because inactive competition and regulatory agencies do not make dispositive findings of absence of monopoly, there seems to be a perception that the FANG monopoly argument is winning. Against this backdrop, the current structuring of the FANG conversation makes it tempting to pick one side or the other, leading us to neglect one hard underlying question: is the binary monopoly-non monopoly model applied in competition and regulatory decision-making the right framework to diagnose and discipline anticompetitive conduct and transactions in FANG industries, or should it be replaced by an alternative theory? We shall entertain no certainties about this question. See EU Commission decisions against Google of 2017 and 2018, Australian Competition and Consumer Commission report of 2018, German Bundeskartellamt decision against Facebook of 2019, and EU recent opening of an investigation against Amazon. 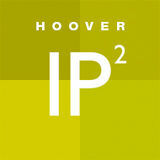 2 The problem exists in other areas of competition law. Cartel laws rely on models of competition with and without agreement, making it uneasy to fight welfare reducing tacit collusion or intra group conspiracies. 3 Though in real life, we know that temperature gets colder as one moves closer to the sun. See Kyle Hill, ‘Forget Icarus, Fly As Close To The Sun As You Want!’ (Discover Magazine, 22 April 2014) <http://blogs.discovermagazine.com/but-not-simpler/2014/04/22/forget-icarus-fly-close-sun-want/>. 4 John R. Hicks, ‘The Scope and Status of Welfare Economics’ (1975) Oxford Economic Papers, New Series, Vol. 27, No. 3, 307-326, <https://www.jstor.org/stable/2662172?seq=1#metadata_info_tab_contents>. Hicks however noted that revolutions in economy are changes in “attention”, not of the science itself as in physics. alternative theory of disequilibrium competition with uncertainty (II), and considers competition law and policy implications (III). In our modern times, all papers seem to require a pitch. Ideally the selling point should be counterintuitive and straightforward. Here’s one (hoping its simplistic formulation does not exhaust the reader’s interest in what I hope is a rigorous analytical treatment of the issue): competition policy should be relaxed when power over price is highest, and strengthened when it is lowest. Before we turn to the discussion, allow us two more remarks. First, theory formulation and validation require careful observation. Since we ambition to test a model and propose an alternative theory, we use empirical data taken from FANG 10-K reports to the Securities and Exchange Commission (“SEC”) aware of their limitations. Second, we use the term monopoly throughout the paper to avoid monotony. We therefore dispense with more legally appropriate qualifications like dominance or significant market power. I. As we often do when we talk about patent rights, we associate FANG with monopolies. We are wrong on patents but right for FANGs. Each FANG holds a large share of output in a market where entry is limited. And the fact that high prices, low output and reduced innovation are not manifest in FANG is irrelevant, because absence of evidence is not evidence of absence. What is, however, critical, is that FANGs display significant motivational differences from the textbook equilibrium model where the monopolist equalizes marginal revenue and costs (A). It is precisely this feature that makes the traditional monopoly model a poor framework to discuss FANG firms (B), and that justifies the search of an alternative theory. A. TEXTBOOK MONOPOLY MODEL 1. Theory In the pure world of economic theory, the monopolist is a dictator with absolute powers. No entrant, input seller or buyer can influence its decisions. But how, then, does the lone monopolist set an output and price level combination? The textbook monopoly model is a response to this decision making mystery. Monopoly output and price setting is a “marginalist” process. Assuming profit maximization, the monopolist grows output and lowers prices up to the level where marginal revenue (“MR”) equals marginal cost (“MC”). Put differently, the monopolist decides to produce an extra quantity of output if (and only if) this yields a revenue greater than the costs incurred to produce a marginal unit.5 Of course, in practice, marginalism is not applied by monopolists. But what matters is that the model emphasizes the high level constraints of falling revenue and increasing (or constant) costs that structure a monopolist’s decisional context. In the textbook monopoly model, MR declines as the quantity of output rises. This is because the monopolist is confronted with a falling demand curve for his product.6 To sell more output, the monopolist must lower the price to get (all) people to buy more units of output.7 As served buyers experience satisfaction through consumption, they derive marginally less benefits from extra units, and are thus willing to pay less for them. Moreover, MR is lower than price at each level of output, because all previous units must be sold at a lower price too. Here is an untechnical example to help the non-economist to understand the monopolist’s thinking: do marginal returns on producing 10 additional pages in a long working paper compensate the marginal costs of writing them? In this example, marginal returns are reader’s interest, downloads or citations to the paper. And in both the metaphor and the model, marginal returns tend to decrease when more pages are added to the paper, at least when the reader is a journalist or policy maker. 6 Abba P. Lerner, ‘The Concept of Monopoly and the Measurement of Monopoly Power’ (1934) The Review of Economic Studies, Vol. 1, No. 3, 157-175 (hereafter Lerner, ‘Concept of Monopoly’). 7 John Taylor, Principles of Microeconomics (Cengage Learning 2011) 255. Abba P. Lerner, ‘Concept of Monopoly’ 157. Richard A. Posner, Antitrust Law (2nd edn University of Chicago Press 2001) 12. Note that a monopolist may experience an increase in MR if he reduces output after having wrongly set its initial production level too high, so that MR<MC and MP is negative. 11 Even though there can be convergence when MC decrease slower than MR, though this seem to be a rare scenario. 12 In a natural monopoly, long run average costs decline with output, because MC is lower than average costs. However, even in a natural monopoly situation, MP decrease because MC and MR intersect at some point. See Richard A. Posner, â&#x20AC;&#x2DC;Natural Monopoly and its regulationâ&#x20AC;&#x2122;  Chicago Unbound <https://chicagounbound.uchicago.edu/cgi/viewcontent.cgi?article=2861&context=journal_articles>. 13 As seen before, when customers increase their consumption, they derive less marginal benefits from additional units, and are hence willing to pay less. 14 Note that in an extreme case, MP can be decreasing even with a zero production cost simply because MR is decreasing. 15 And more costly. Additional workers, overtime plans or additional compensation may be needed. But note that even if wages are constant, there still is decreasing marginal product of labor. useful testable hypotheses. In particular, we may be tempted to use firm level data to get a better understanding of FANGs’ decision making universe, and try to draw some inferences on whether they behave like textbook monopolists. This is what we try to do in the following sections. We test the properties and results of the textbook monopoly against a dataset covering Facebook, Amazon, Netflix and Google’s Securities and Exchange Commission (SEC) 10K filings. The basic finding is that FANG seem to operate in a manner inconsistent with the textbook monopoly model (3). Let us see why this is the case, first by setting out our approach to measurement (1), and then by showing our results (2). 1. Evaluating FANGs Decision Making Saying that FANGs are monopolists (as many do) should be a way to suggest that as they increase output, they experience a decrease in MR, and move society one step closer to the inefficient equilibrium level where MR intersects with MC, in turn justifying competition policy or regulatory intervention. If the textbook monopoly model appropriately applies to FANGs, we should thus be able to observe decreasing MR and MP at firm level. To assess this, we need to know FANG’s year over year revenues, costs and profits. We can retrieve this data from their 10Ks. However, SEC reporting firms are not required to disclose information about output or quantities sold.16 While some companies like Amazon like acknowledge “increased sales”,17 we have no readily available quantitative measure of output that entitles us to compute revenues, costs and profits on a marginal basis, as required to estimate MR and MP. A more extreme approach could have been to think of Google producing in the US, and exporting elsewhere. On that basis, we could have allocated all COGS to Google’s US revenue. We show the result of this in Appendix 2. The analysis does not change significantly. 3. Discussion The FANG monopoly hypothesis fails the test of evidence. Unlike a profit maximizing monopoly, the decision making of a FANG cannot be about setting short term output so that MR=MC, absent a foreseeable perspective that both curves will intersect. This has two logical implications. First, assuming that MR=MC remains a valid profit maximization proposition for FANG firms, it must be a long term perspective.20 Second, FANG firmsâ&#x20AC;&#x2122; short term profit maximization approach must be about something else. If we consider it a reasonable proposition to think that there are income constraints and declining marginal product of labor. But what is it? Let us look another time at our data, and think of further differences with the textbook monopoly model. In standard economics, MR reflects the slope of the demand curve. A possible interpretation of rising MR is that FANGs face an upward slopping or shifting demand curve in the short term, denoting higher user willingness to pay as output rises.21 This could be a fundamental difference with the textbook monopoly model where demand is downward slopping and fixed.22 All this suggests that FANGsâ&#x20AC;&#x2122; short term goal should be to grow output, period. This is consistent with anecdotal observations of early loss making by FANGs like Amazon, who prioritized growth over (net) profits in early years forecasting a long term divergence between rising MR and MC. True, output also grows in the textbook monopoly model. First, output grows up to the profit maximizing level. And output may also grow strategically, when the monopolist attempts to keep potential rivals out of the market. But a difference with FANGs is that when output increases in a traditional monopoly setting, it is always bounded: intersecting MR and MC prevents the monopolist to serve all quantities demanded. And when the threat of entry disappears, expansion ceases. This is not the case in a FANG setting, where output growth seems unconstrained. All this cautions against calling FANG monopolies, and drawing early policy implications. But all this leaves also open a critical question: if FANG are not monopolies in the short term, how do they compete? Indeed, FANG may face a falling demand curve that is shifting upwards year after year. We discuss this distinction in the following sections. 22 True, output also grows in the textbook monopoly model. It does up to the profit maximizing level. And it may also grow strategically, when the monopolist attempts to keep potential rivals out of the market. But when output expansion occurs in a monopoly setting, it is always bounded: by MC or in time once the threat of entry is gone. This is not the case in a FANG setting, where output growth is unconstrained. Other streams of economics studies consider upward slopping demand curve in markets with bandwagon effects. See Harvey Leibenstein, ‘Bandwagon, Snob, and Veblen Effects in the Theory of Consumers' Demand’  The Quarterly Journal of Economics, Vol. 64 No 2 183-207 (hereafter Leibenstein, ‘Bandwagon’); Gary. S. Becker, ‘A Note on Restaurant Pricing and Other Examples of Social Influence on Price’  Journal of Political Economy 99 (5) 1109-1116. 24 The literature network effects literature is copious, though much work concentrates on topics like lock in, winner takes all, switching costs, price discrimination and bundling, important to decision makers interested in improving social or private gains. 25 Hal R. Varian and Carl Shapiro, Economics of Information Technology (Cambridge University Press 2004) 33. 26 Nicholas Economides, ‘The economics of networks’  International Journal of Industrial Organization 14 673 at 678 (hereafter Economides, ‘Economics of networks’). 27 Michael L. Katz and Carl Shapiro ‘Network externalities, competition, and compatibility’  American economic review, 75(3), 424-440 (hereafter Katz and Shapiro, ‘Network externalities’. The intuition behind this phenomenon is easy to understand: a marginal increase in my consumption of a network good produces positive externalities on third parties who join the platform, triggering an increase in my own consumption and WTP. This positive feedback loop stops at some point, when the marginal benefits that I derive from the network stem more from its own functionality that other users’ adoption. We discuss below both the individual demand curve and the market demand curve. Economides, ‘Economics of networks’ 678 (“Network externalities “signifies the fact that the value of a unit of the good increases with the number of units sold. To economists, this fact seems quite counterintuitive, since they all know that, except for potatoes in Irish famines, market demand slopes downwards. Thus, the earlier statement, “the value of a unit of a good increases with the number of units sold,” should be interpreted as "the value of a unit of the good increases with the expected number of units to be sold." Thus, the demand slopes downward but shifts upward with increases in the number of units expected to be sold.”. 30 The crossing points are virtual equilibrium points. On this, see the early work of Leibenstein, ‘Bandwagon’ 194. The demand curve slopes upward as long as there is an increasing marginal external consumption effect. And then it slopes downward when the value derived from increases in n(z) wears out. In that case, v(x) recovers a determinant role, yielding decreasing marginal benefits as under the standard demand curve. The difference between both representations is a matter of exposition, not ideology. In the first case, the price effect and the consumption externality effects are accounted for together.31 In the second representation, the price effect and the consumption externality are accounted for separately.32 Whichever diagrammatical representation best represents the real world (we could actually invent more of them, depending on how we formulate the problem), what matters more is that in network effects markets, the demand curve may contain an upward-sloping segment.33 2. Disequilibrium The unordinary demand curve met in network effects markets has a key implication. When firms operate in the upward slopping region of the demand curve, there is no stable equilibrium. A perturbation in market conditions – including one due to the firm’s own decisions – can precipitate the firm towards success or ruin. Paul Belleflamme and Martin Peitz explain: “[T]he impact of the Law of Demand (according to which the quantity demanded decreases with the fee) is more than compensated by the network effect (which increases the consumers’ willingness to pay as demand expands)”. See Paul Belleflamme and Martin Peitz, The Economics of Platforms (Cambridge University Press 2018) Chapter 3 mimeo (hereafter Belleflamme and Peitz, The Economics of Platforms). 32 Traditional economists who consider that “an upward slopping demand curve is inconsistent with economic theory” tend to prefer the second representation. See Robert S. Pyndick and Daniel Rubinfeld, Microeconomics (9th edn Peason 2017) 737. We ought to note here that Gary Becker, hardly an untraditional economist, used the first method in his work on bandwagon effects. See Gary S. Becker, ‘A Note on Restaurant Pricing and Other Examples of Social Influences on Price’  Journal of Political Economy 99 (5): 1109-16. 33 Belleflamme and Peitz, The Economics of Platforms. In appendix 3, we show a diagrammatical representation of a discontinuous demand curve for a network market, where the network effects appear on the left hand side part of the diagram, and where the demand curve recovers its traditional slope on the right hand side. Economists talk of a “fulfilled expectations demand curve” (Nicholas Economides, ‘Competition Policy in Network Industries’, in Dennis W. Jansen (ed.) The New Economy and Beyond, (Edward Elgar Pub 2006) 101103). Behind this complicated term, lies a fairly simple idea: failure to add new users/keep existing users in the growth stage of the market decreases the realized utility of past adopters below their initial expectations. This leads to network churn. By contrast, failure to add new users/keep existing users in the mature stage of the market does not reduce utility below the expected level of quality that has been realized. This leads to network rigidity. 35 An example of the following approach showing how pricing decisions can place firms below or above equilibrium, and influence success or failure in reaching critical mass, see David Easley and Jon Klinberg, Networks, Crowds, and Markets: Reasoning about a Highly Connected World (Cambridge University Press 2010) 17.3. 36 Or, to put it differently, a discrete decrease in price from A+ could result in a large increase in quantity, consistent with traditional demand curve effects. Jeffrey Rohlfs, ‘Theory of Interdependent Demand for a Communications Service’  Bell Journal of Economics and Management Science, 5 (1), 16-37 (hereafter Rohlfs, ‘Theory of Interdependent Demand’). 38 David S. Evans and Richard Schmalensee, ‘Failure to Launch: Critical Mass in Platform Businesses’  Review of Network Economics, Vol. 9: Iss. 4, Article 1 (hereafter Evans and Schmalensee, ‘Failure to launch’) 39 Belleflamme and Peitz, The Economics of Platforms. 40 Rohlfs, ‘Theory of Interdependent Demand’ 16-37.
of users can expect a high participation equilibrium. By contrast, firms that do not reach a critical mass of users can expect network collapse. There is a right and wrong way to think about critical mass in network effects markets. To caricature, the wrong way pitches critical mass as an economic model predicting that as soon as a firm in a network effect market crosses a fixed point of user adoption, it ignites an automatic cycle of self-reinforcing technology diffusion that ends with near market monopoly. The right way looks at the principle of critical mass not as a theory, but rather as a “mental model”47 apt to characterize complex “recurrent behavior patterns” when “people's behavior depends on how many are behaving a particular way” in technology markets (but also in other walks of life like sports or university seminars).48 Though economists are predominantly on the right side of the discussion, a number of hidden complexities of the critical mass principle leads non-economic savvy readers to cultivate misconceptions about it.49 To paraphrase Hal Varian talking about network effects, critical mass is one of those ideas “that you can explain to a regulator in five minutes and they can talk about it for five months”.50 More specifically, the simplicity of the intuition behind the critical mass principle obfuscates that it is actually a driver of complexity for firms operating in network effects markets. Let us discuss this in more detail. from petering out.”). See Thomas C. Schelling, Micromotives and macrobehavior (W. W. Norton & Company 2006) 89 (hereafter Schelling, Micromotives). Arthur, ‘Competing Technologies’.. 47 Tren Griffin, ‘Two Powerful Mental Models: Network Effects and Critical Mass’ (Andreessen Horowitz, 7 March 2016) <https://a16z.com/2016/03/07/network-effects_critical-mass/ accessed 12 April 2019> (hereafter Griffin, ‘Two Powerful Mental Models’). 48 Schelling, Micromotives 94. 49 Schelling observes that the concept of “mass” is inappropriate in physics, and that “number”, which is its economic functional equivalent, is also unsatisfactory See Schelling, Micromotives 95 (“whether the measure is the number of people engaged, or the number times the frequency or the length of time they engage in it, or the ratio of the number who do to the number who do not, or the amount of such activity per square foot or per day or per telephone extension, we can call it a "critical-mass" activity”) 50 Hal Varian, ‘Use and abuse of network effects’ (SSRN, 7 Augustus 2018) <https://papers.ssrn.com/sol3/papers.cfm?abstract_id=3215488> accessed 12 April 2019. What this all means is simple. Firms are living organs. And all growing firms, including large ones, face critical mass challenges.61 Most successful rock n’ roll bands contemplating stadium performance know this. c) Critical mass is not exogenous Unlike in nuclear engineering, critical mass effects do not arise in markets due to the laws of nature.62 Already in 1985, Katz and Shapiro noticed this property. Observing that one would like a theory that tells what leads to the zero adoption or to the high participation equilibrium, they asked “what can consumers and firms do to influence the market outcome”.63 In hindsight, Katz and Shapiro early captured the intuition that because network effects vary in strength, more is needed to trigger mass technology adoption. 35 years later, we still miss the theory, but we know a lot more. First, market institutions and firms’ strategies influence technology diffusion. This influence is highest when firms are below the critical range, and lowest when firms are above. Second, below the critical mass, price is only one of the numerous devices available to reach the critical mass.64 By contrast, when the critical mass is reached, “installed base effects drive diffusion even in the absence of price decreases”.65 Crossing the critical mass thus simplifies the set of firms’ profit maximizing options, including by plausibly allowing exercise of power over price. One diagrammatical implication of this point is that network size cannot be normalized, and the demand curve should shift upward, without being tied to a fixed point on the horizontal axis. 62 Some authors have proposed the following assumption: See, Lechman, ICT Diffusion 50 for an overview of the literature. 63 Katz and Shapiro, ‘Network externalities’. 64 Katz and Shapiro provide a list of firms strategies (pricing commitments on complementary software, “second sourcing”, vertical integration, “penetration pricing”, etc.. 65 Grajek and Kretchsmer, supra 47 note that the emergence of critical mass is conditioned on “strength of installed base effects, the size of the installed base, and the current market price”. For this definition, see Grajek and Kretchsmer, ‘Identifying critical mass’. Allen, ‘New telecommunications services’. This in turn, entails the equilibrium possibility of introductory pricing in network effects markets; Luis M. B. Cabral, David J. Salant and Glenn A. Woroch ‘Monopoly pricing with network externalities’ (1999) International Journal of Industrial Organization 17, 199-214. 67 Allen, ‘New telecommunications services’ (the market is mature). 68 Ulrich Witt, ‘“Lock-in” vs. “critical masses” – Industrial change under network externalities’ (1997) International Journal of Industrial Organisation, 15, 753-773 69 For they are under-representative of the richness and sophistication of the economics literature. 70 See Schelling, Micromotives, 92.
consisted in tweaking the algorithm of its newsfeed. To make things concrete, Facebook has decided to show top stories or family content, rather than relying on mere chronological order. e) Critical mass is not firm but market specific Often, the critical mass story is not told with care. Many works – including this one – discuss if, how and when firms reach critical mass, when they should instead talk about markets. To put things differently, it is not a firm that reaches critical mass, it is the market. To see what happens when the focus of analysis shifts, let us quote Tren Griffin: “What happens if a market does “tip”… but it’s the competitor that reaps those benefits?”.71 Griffin offers the following example: MySpace made the early investments in social networks, pushing the market towards critical mass. But MySpace was impatient. Facebook was not. Facebook’s slow monetization strategy eventually paid off. The deeper point made by Griffin is that investments into critical mass are imperfectly appropriable.72 Competitors can free ride on rivals’ network specific investments. This property of network effects markets can work both to the benefit of late entrants, as in the Facebook and MySpace story, and to benefit of incumbents, as evidenced by Facebook development of Instagram in a market initially occupied by Snapchat. B. UNCERTAINTY When network effects markets are in a state of disequilibrium, firms behave under uncertainty. If we consider FANGs’ disclosures in 10K reports (1) as well as industry specific fact patterns (2), there are sound reasons to believe that the model of disequilibrium competition with uncertainty is apt to characterize their environment. See Griffin, ‘Two Powerful Mental Models’. The other point is that rival firms have distinct perceptions of critical mass levels. Eric Schmidt, ‘The New Gründergeist’ (Google Europe Blog, 13 October 2014), <http://googlepolicyeurope.blogspot.com/2014/10/the-new-grundergeist.html>. See also Dominic Rushe, “Jeff Bezos tells employees 'one day Amazon will fail”, The Guardian, 16 Nov 2018 (“Amazon is not too big to fail … In fact, I predict one day Amazon will fail. Amazon will go bankrupt. If you look at large companies, their lifespans tend to be 30-plus years, not a hundred-plus years”). 74 For use of the expression ghost town, see Alex Moazed and Nicholas L. Johnson, Modern Monopolies: What It Takes To Dominate the 21st Century Economy (St Martin’s Press 2016). In 2017 Amazon drew 9,81 % of its net sales from AWS. See Amazon 10K for 2017 at https://www.sec.gov/Archives/edgar/data/1018724/000101872418000005/amzn-20171231x10k.htm. 76 Since it is based on high risk bets with low probability of success. We also would all be as rich as Jeff Bezos or Marc Zuckerberg. incremental fees.77 Intense customer backlash did not prevent AOL from further growing its users base in the following years. Arguably, AOL’s post 1996 growth took place in the downward slopping region of its demand curve. Closer to us, Netflix brings a possible example of a firm that may have reached critical mass, and knows it. In its 10-K for 2009, Netflix declared: “We have achieved a level of scale in our business that provides many operational and competitive advantages [...] Such scale economies also have contributed over time to expanding operating margins which has made it possible for Netflix to aggressively price its service offering at levels difficult for competition to meet”.78 Uncertainty can arise from the supply side. Recall that in FANG markets, MP increase. When this is understood, the implication is clear: network markets in disequilibrium offer highest profit opportunities. Mario Rizzo goes as far as stating: “profits exist only in a world of uncertainty and disequilibrium”.79 The practical economic consequence is straightforward. One should observe relatively higher competitive entry in the portions of the demand curve that slopes upward. Again, anecdotal evidence of bold FANG strategic moves seems to carry the point. Microsoft’s Bing attack against Google’s Internet search service or Google’s Android attack against Apple’s closed smartphone ecosystem or Apple’s entry into entertainment to challenge Netflix. Alternatively, disequilibrium profit opportunities may be the business rationales behind FANGs attempt to cream skim profitable market segments. Microsoft’s purchase of professional social network LinkedIn looks like specialist entry into social networks. The same can be conjectured of the launch of FB’s 10 minutes’ video uploading IGTC service, which looks a lot like a pointed attack at Google’s YouTube. Complementors are also a source of uncertainty. To think about this, consider the example of apps and operating systems (“OS”). On the one hand, apps bring added value to an OS, and increase users WTP for the OS. On the other hand, apps capture value from the OS. The underlying economics are straightforward: due to an “income constraint” – economic agents have a finite resources – users faced with a new complementary application B or C, will devote relatively less to A.80 Of course, A may still benefit from an anchoring effect.81 Yet, it is readily apparent that complements generate ambiguous effects. Add to this that complements sometime reconfigure the structure of an industry. In his famous Tidal Wave memo of 1995, Bill Gates speculated about how the Internet, a complement to Microsoft’s OS and productivity software. Gates correctly conjectured the appearance of a whole host of competing products, like new file formats, browsers and even less expensive devices for Web browsing. Competitive entry in adjacent, neighboring or complement product spaces reinforces uncertainty, and therefore yields pressure on incumbents’ products. Last, firms in disequilibrium markets may not only be victims, but also active agents of uncertainty. Because third party entry dissipates the likelihood of long term equilibrium profits, incumbents in network markets are incentivized to look for emerging or future disequilibrium markets, adding even more uncertainty to the business environment. In the 1990s, AOL spent millions on developing its own movie and media offering, only to discontinue it a few years later. In the 2000s, Microsoft invested successfully in games, and less successfully in online press content. And today, we see many FANGs entering online payments or wearable devices like connected glasses or watches. If you live in a neighborhood without a Starbucks, then you have a budget for detergent at Walmart that is x; now assume there is a Starbucks and you like it. You will spend y less at Walmart, where y<x. 81 For admittedly, the loser might be unrelated pizza night. It is time to move on. Now that we have pointed out to the existence of a competitive constraint due to uncertainty in the disequilibrium region of FANG markets, we must complete our description by specifying normative public policy implications. So what are they? III. In his 1974 paper, Rohlfs noted that that attaining the socially optimal equilibrium user set “may require ruinous (albeit temporary) promotional costs”. See Rohlfs, “Theory of Interdependent Demand” 19.
disruptive technologies, and incentivized the computer industry to move elsewhere leading to the emergence of Google, Facebook and myriad other firms. Overall, characterizing firms’ strategies in disequilibrium markets probably requires adjustments of competition law and policy’s frameworks.83 Hereafter, we discuss several options for law and policy reform. All are essentially first principles. B. POLICY PRIORITIES: EQUILIBRIUM, NOT DISEQUILIBRIUM? From a comparative statics perspective – the perspective usually taken in competition policy – markets in equilibrating tendency represent higher risks of higher social costs. This is due to convergence between marginal benefits that decrease (the demand curve slopes downward) and/or marginal costs that increase (the supply curve slopes upward). While above cost pricing in a disequilibrium market is a moot problem (an overpriced service will instantly collapse to the 0 equilibrium), it is a possible source of deadweight loss in an equilibrium market. The interesting consequence for a competition policy framework committed to consumer welfare (CW) is that it should place priority emphasis on equilibrium markets. Counterintuitively, this also means that some competition policy instruments should be relaxed when power over price is relatively highest (when marginal profits increase during disequilibrium) and strengthened when it is relatively lowest (when marginal profits decreased during equilibrium). But can we refocus competition law and policy towards certain types of markets where levels of competitive harm exceed certain threshold levels? At a high level, nothing pleads against this. See already in 1998 (with reference to predatory pricing), Lemley, Mark A. and McGowan, David, Legal Implications of Network Economic Effects. 86 Cal. L. Rev. 479, 1998 (“Arguments based on network effects may suggest that the law must rethink the rationality of behavior considered un-likely under neoclassical theory, such as predation in antitrust jurisprudence, and address new risks not considered under models based on declining returns”). Harvey Leibenstein, ‘Allocative efficiency vs “X-Efficiency’”  American Economic Review Vol. 56 No. 3, 413 (hereafter Leibenstein, ‘Allocative Efficiency’). 89 By contrast, monopoly or oligopoly positions are less informative. Competitive pressure is compatible with industry concentration, because as costs declines, “some firms are forced out and fewer firms exist”. See Leibenstein, ‘Allocative Efficiency’ 411.
may be considered like entry and exit choices, R&D expenditures and intensity, rate of product introduction, change in business methods and strategy, capital allocation choices, etc. 2. Bad Conduct: Competing under, against and after Uncertainty? Antitrust laws proscribe “bad conduct” that by purpose or effect harms the competitive process. We discussed previously the ambiguity inherent in categorizing FANG conduct as anti or procompetitive. disequilibrium markets. What should it be? In addressing this question, it is useful to recall that the main source of hardship for firms in disequilibrium markets is uncertainty. And it is also useful to observe that uncertainty is in the social interest because it incentivizes firms to compete and innovate. The normative implication of this is obvious: private incentives may not be aligned with the public interest, and there is a market failure justification for competition enforcement if firm conduct in disequilibrium markets reduces uncertainty. Interestingly, existing competition doctrine accepts to catch uncertainty reducing behavior as a form of “bad conduct”. See Commission Decision, IV/31.370 and 31.446, UK Agricultural Registration Exchange, 17 February 1992, OJ L 68 of 13 March 1992, 19 para 43 and on a low degree see T-35/92 John Deere Ltd v Commission  ECLI:EU:T:1994:259, 47–9). that compete under uncertainty take the environment as given and accept failure. They do not “stick” to a failing business concept. For more on this, see Petit, 2019 (forthcoming, Oxford University Press). <https://www.recode.net/2018/8/20/17757412/elad-gil-startup-handbook-scaling-growth-optimism-pessimismculture-kara-swisher-decode-podcast> accessed 12 April 2019.
of tail risks of anticompetitive effects due to killer mergers with startups. But any policy adjustment of this kind would need to be based on evidence (i) that startup independent exit represents a class of low probability, high social benefit event; (ii) that the social benefits worthy of merger control protection outweigh the private benefits to startup founders and the social costs of a decrease in exit opportunities for other entrepreneurs; and (iii) that ex ante merger control intervention is necessary, short a less costly ex post alternative that would consist in remedying past mergers on the basis of subsequent market developments. Are these conditions fulfilled? Until now, we have little evidence that this is the case. A paper that is often cited in competition policy circles claims that 6.4% of all acquisitions in its dataset are killer acquisitions.96 Perhaps, this meets the low probability prong of the first condition. But this leaves all others unanswered. Conclusion This paper has presented the rudiments of a theory of disequilibrium competition with uncertainty. This framework may assist antitrust and regulatory decision makers in assessing whether FANG firms and many othersâ&#x20AC;&#x2122; strategies are procompetitive or anticompetitive. True, our framework can be criticized as incomplete, abstract and perhaps even unpractical. And yet: because knowledge is cumulative in nature, we hope that our preliminary theory, with both its strengths and weaknesses, will assist competition and regulatory agencies in their much necessary ongoing efforts to rethink the application of competition law to digital industries. Colleen Cunningham, Florian Ederer and Song Ma, â&#x20AC;&#x2DC;Killer Acquisitionsâ&#x20AC;&#x2122; (SSRN, 28 August <https://ssrn.com/abstract=3241707>.